Seafarer Mama/Karen has loved gardening since she began getting her hands dirty beside her grandmother at the tender age of 3 or 4. 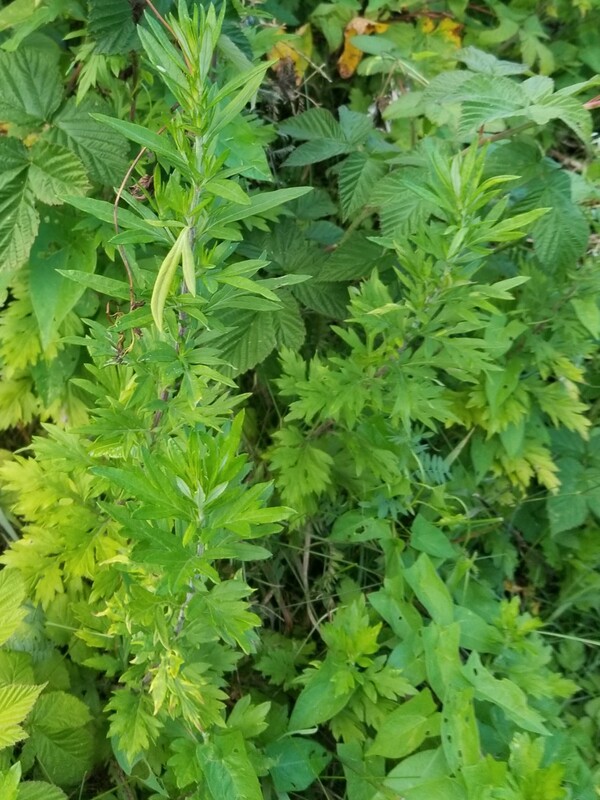 Is mugwort an invasive weed or a medicinal plant? When you meet mugwort on your path, what do you do? Are you tempted to pull it up at its roots or take some home? I know someone who tries with all of her might to eradicate it from her property, only to be healed by poultices made with stem-fulls of its leaves during a recent trip abroad. 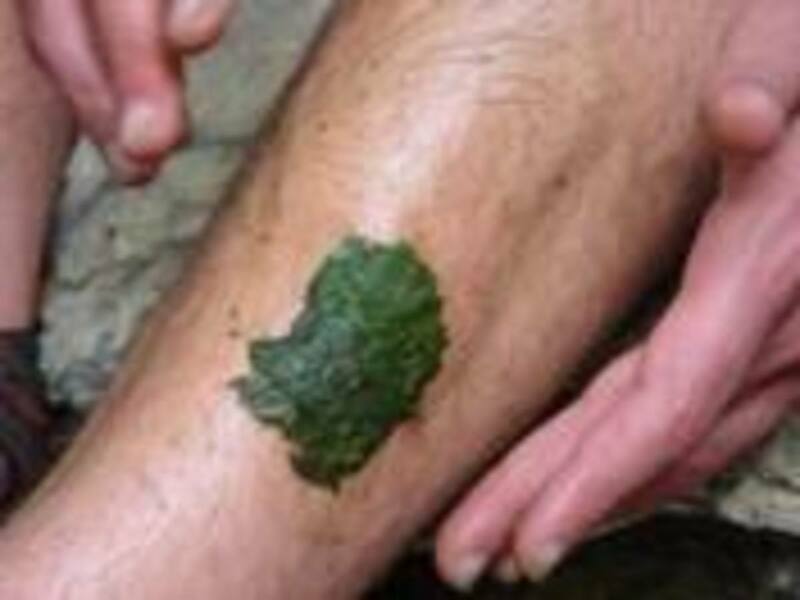 She was able to find humor in this and sent pictures of her leg bedecked with mugwort poultices. The Latin name for mugwort is Artemisia vulgaris. The plant eventually made its way west to North America from Asia and Europe. It grows plentifully and is so hardy that it often takes over and kills other plants if allowed to take seed in a garden bed. It is smart to keep a large margin between the wild mugwort on your property and your fruits, veggies and flowers. But, while you are pulling it up by its roots, why not take it home and brew a cup of tea with it? It may seem like a headache to manage, but it is also a gift to us from Mother Earth. 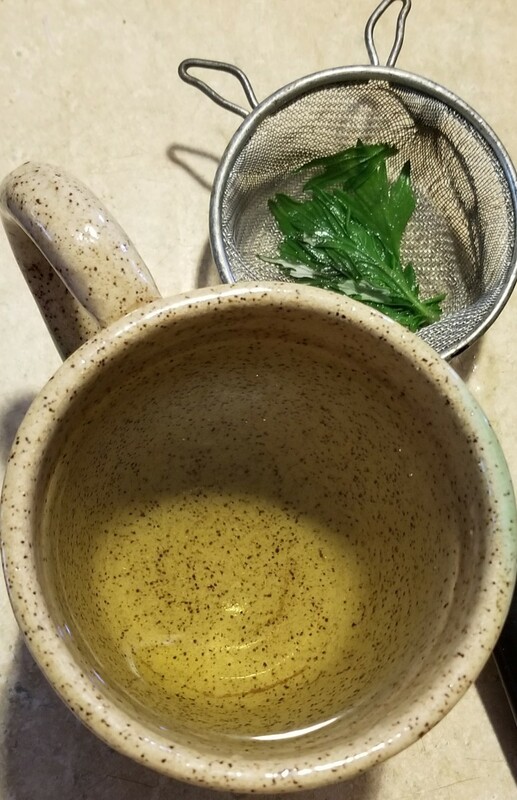 Below are photos and a description of some of the medicinal benefits enjoyed by people who have used mugwort as a medium for healing and wellness. Developing excema can be an indicator that you are allergic to mugwort. It can be toxic if overused, so only one cup daily is recommended. 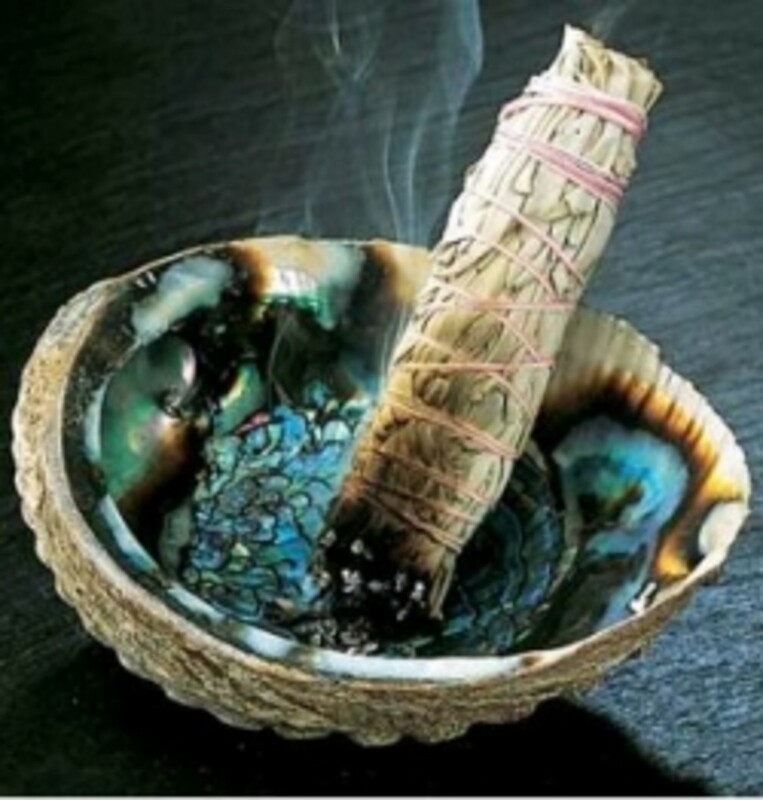 Smudging is done by lighting a bundle or braid of herbs and swirling the smoke around you as a means of purification in preparation for a sacred ritual, by banishing negative energy from around you. 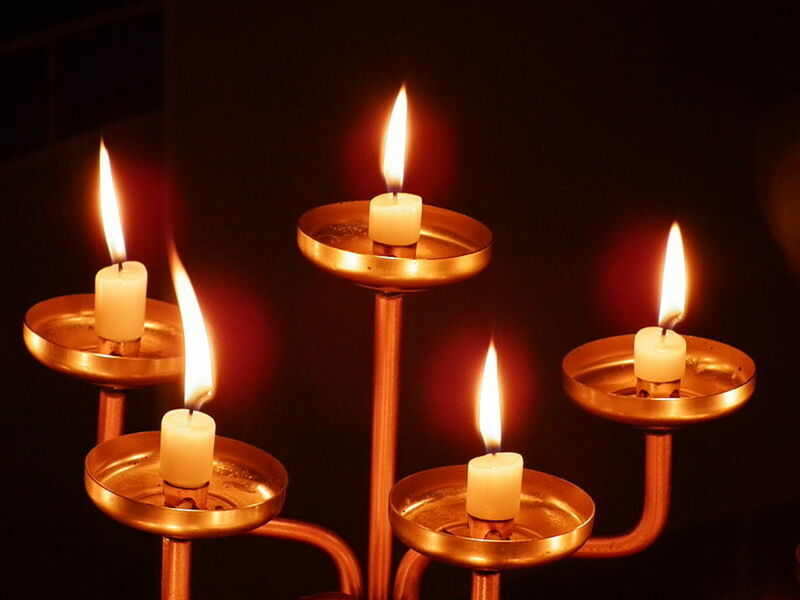 It is used to purify the space used for a ritual, as well. It can be used to cleanse the energy in your home, too. Traditionally, Native Americans used (non-European) white sage, Artemisia tridentia, most often in ritual, but mugwort (Artemisia vulgaris) was also used. Mugwort was used as part of a a sleep-inducing ritual to banish insomnia and stimulate divinatory visions and dreams. It is best to not ever smudge yourself with mugwort before driving. There are unique benefits to creating topical herbal poultices for human health and healing. They are created by warming the leafy stems in water and crushing them into a pulp, which is applied directly to the skin. Bunches of warm mugwort have also been used whole, laid out over the spots that need healing. The warmer they are when they are applied, the greater their healing potential because the body's circulation is stimulated on that spot, the healing properties of the herbs are experienced more deeply, and the relief from pain more quickly and lasts longer. Earth wants us to use her gifts to heal ourselves and others. Using caution around determining the potential for allergic reaction is an important step before use; but if an individual is not allergic to a particular herb, it can be used by anyone who needs it, and its effects will be purest because they've been harvested straight from the source. Offering a gesture of gratitude at the time of harvesting is all that is asked of us. *IMPORTANT: Consult with your doctor before consuming mugwort in any manner! It is a potential allergen and can be toxic to consume in large amounts. I delight in surprising people, so I'm glad you ebjoyed reading this article. Thank you, Bill! May not grow in the American Northwest region. Thank you for stopping by to read and share your thoughts. Never heard of it. Certainly never seen it. Very cool article, my friend. I love learning new things. Hope you do, Eric! Thanks for stopping by. Well that is extremely cool. I'll have to look it up to see if we have any.